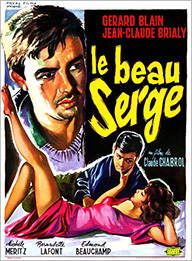 Claude Chabrol invokes film noir's fascination with doppelgangers as he creates a slashing update of French noir's venerable "provincial Gothic" subgenre in his directing debut, presaging the Nouvelle Vague and jump-starting one of French cinema's most accomplished and idiosyncratic careers. 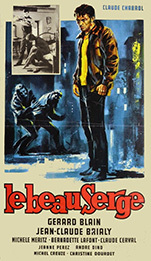 The escalating tension between two long-time friends (Gerard Blain, the "handsome" Serge whose life has stagnated into a series of drunken rages; Jean-Claude Brialy, the scholarly François, whose escape from his provincial hometown is not as complete as he images) plays out in the deceptively pastoral setting of Sardent, where the beauties of the winter landscape cannot conceal the sordid lives that are going nowhere. With Gérard Blain, Jean-Claude Brialy, Bernadette Lafont, Michèle Méritz, Claude Cerval, Jeanne Pérez, Edmond Beauchamp. (1958, dir. Claude Chabrol, 98 min.) Screenplay: Claude Chabrol. Cinematography: Henri Dacae. Film editing: Jacques Galliard. Music: Émile Delpierre. 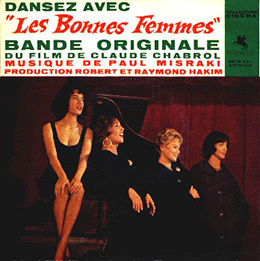 After re-teaming Brialy and Blain in a tale of sexual intrigue (Les cousins) and trying his hand at murder mystery (À double tour), Chabrol takes dark aim at the battle of the sexes, initiating a theme that will recur in many of the subsequent films in The French Had A Name for It 4. 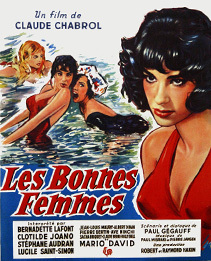 Les Bonnes Femmes tracks the lives of four Parisian shopgirls and the emotional and physical dangers of their forays into heterosexual love. Cinematographer Henri Dacae continues his haunting mastery of Parisian locations, including dark streets, nightclubs—and the film's tour de force moment, a visit to the Paris zoo where it becomes clear that society has a fate in mind for the women that is all too analogous to the caged animals on display. (A grisly but oddly related factoid: screenwriter Paul Gégauff was later stabbed to death by his wife.) 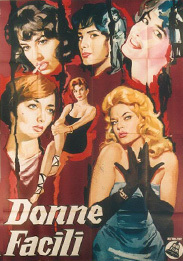 With Bernadette Lafont, Stéphane Audran, Clotilde Joana, Lucile Saint-Simon, Pierre Bertin, Jean-Louis Maury, Albert Dinan. (1960, dir. Claude Chabrol, 100 min.) Screenplay: Paul Gégauff (scenario & dialogue) and Claude Chabrol (adaptation). Cinematography: Henri Dacae. Film editing: Jacques Gaillard. Music: Pierre Jansen and Paul Misraki.